Summer is the time for fun under the sun and in the water. Enjoy your cheerful day together with your little kids. They will play in water and on white sand happily. To do these activities safely and comfortably, you certainly need appropriate swimsuits for your children; and this article will particularly talk about the girls swimsuits. Your little girl will make a direct contact with the sunshine when swimming. The direct contact to sunlight is very harmful for her skin, especially at noon. It not only makes the skin rough but also potentially increases the risk of getting skin cancer. The risk of getting cancer is most sharply affected by the sun exposure for the period of childhood. Sunburn in childhood may double up the chance of getting the disease. Therefore, protecting your girls and dress them with appropriate swimsuits sound to be the best idea. Actually you can protect your girl with sun block product. But it’s not enough since sunscreen can sheer off after some hours. Then for the longer lasting protection, you can dress her with the right swimsuit. Swimsuits must fit well. They are neither too tight nor too loose. The too tight swimsuits can bring about difficulty to breathe freely and cause the straps bite her tender skin. And the too loose swimsuits can bother your girl’s movement and collect sand which will irritate her. Choose swimsuits which are designed to prevent rashes on the skin for they give you double benefits. Not only it protects the skin from the dangerous UV rays but also care for skin which may be sensitive to the chemicals those are sprayed into the water. Then you must select the fabric of the suit which allows her to breathe and endure to chlorine pools and the sea without getting fuzzy after a few washings. Now let’s take a look on the kind of swimsuits for your girl. Then you can make the right decision depends on her need. A one-piece swimsuit is a commonly skin-tight. It can cover your girl’s torso. The most popular type of one-piece suit is tank suit. It looks like a sleeveless bodysuit. And now there’s bodyskin as the latest innovation of one-piece swimsuits. It is rather similar to a unitard or wetsuit. It can cover the whole torso, arms and legs; and can lessen friction against water. Talking about wetsuit, wetsuit is made of neoprene, thicker material which is not only very flexible but also can keep the body temperature stable. Besides protecting from UV ray, these children swimsuits also protect them from sharp rocks, shells, and even hypothermia. If you decide to choose one piece, it doesn’t mean plain. You may select a swimsuit with bows, ribbons and raised patterns to make her more fashionable. There are large amount of colors and patterns to pick out. In line with its name, this swimsuit consists of two separate parts. The types among others are skirtinis, tankinis and monokinis. Skirtinis and tankinis are two piece swimsuits which are easy to move around without being too loose or too tight. Since your little girl is very active and never stops moving, therefore skirtinis and tankinis are suitable to fulfill this need. The two-piece swimsuit also allows you to get access to the diaper easily, so that you can change it quickly when it is needed. Since I consider that this information (flotation) will be useful for you, so I write it here. As you won’t put your little girl in danger thus a flotation is needed to keep her safe while in water. Usually a lot of parents place their baby into small inner tubes. But now there is a new alternative, it is a baby swimsuit which contains flotation in it. 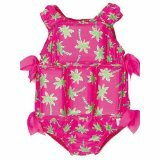 These swimsuits are available in a variety of styles and the flotation tools are also in many shapes to support your girl to float and look good while swimming. After all, you must let her try on a few styles. Ask her which one she feels most comfortable in and start from there.